Disclosure: I received free samples of Libby’s new Vegetable Pouches mentioned in this post. By posting this recipe I am entering a recipe contest sponsored by Libby’s and am eligible to win prizes associated with the contest. I was not compensated for my time. A typical hot dip recipe requires cold ingredients to be heated through in about five inches of dip. That single heating step, is going to take you over half an hour. By heating the main ingredients to a hot dip before they jump in the oven, you're cutting baking time to five minutes. The new Libby's Vegetable Pouches, like the corn one I used in this recipe cook in a minute and are shelf stable. They're the easiest thing to keep in the pantry for quick hot appetizers like this one throughout the holiday season. /// Directions /// Chop peppers, onion and jalapeño. Chop herbs and set aside. Shred smoked cheese. Mix the mayo, greek yogurt, neufchâtel cheese and shredded cheese in a bowl with liquid smoke. Mix in chopped veggies. Microwave corn and drain. Mix all in a large cast iron skillet in a single layer. You want to put it in a larger skillet so the thin layer heats through more quickly than a deep dish version. Broil about 5 minutes on the top rack until the dip begins to bubble and brown. Top with green onion and cilantro. Grind black pepper over the top. Service with crackers, bread or endive. 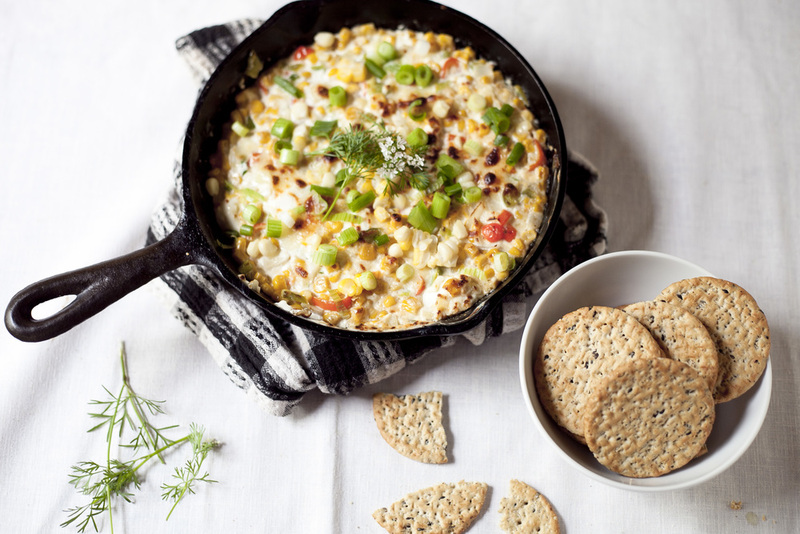 By using reduce fat dairy and pumping up flavors with onions, veggies and smoky cheese (and liquid smoke) you have a healthier dip for the holidays!